To continue celebrating my two year blogiversary, I thought I’d throw myself a little virtual party. For this week’s blog hop, I want to see your best party recipes – I’m thinking appetizers, hors d’oeuvres, and finger foods galore. I know that I can always use fresh inspiration when it comes to this stuff and I can’t wait to see what you come up with! I’ve sifted through my archives to find a few of my favorites as well. Also, if you haven’t entered my mega Magimix giveaway (we’re talking a food processor and juicer attachment!!!) enter now! 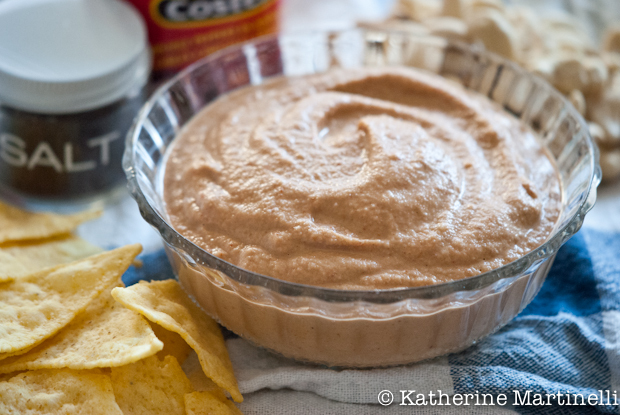 As you know, I’m obsessed with this smoky cashew salsa I shared with you a few weeks ago. It will definitely be making an appearance at most of my parties from here on out. 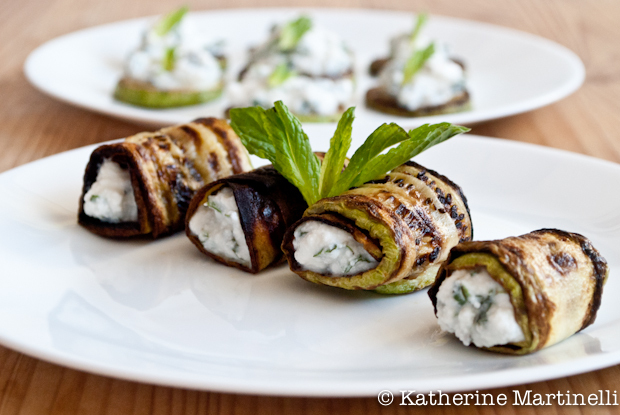 I also love these versatile beauties with zucchini, ricotta and mint. They’re fresh, light and gluten free! 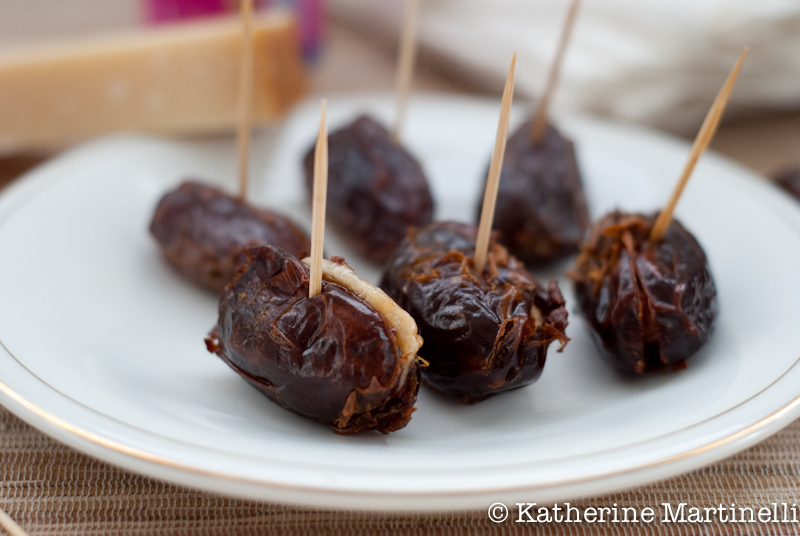 And it wouldn’t be a party without these fast, easy, and simply seductive Parmesan-stuffed dates. They’re the perfect cocktail snack in my book! Other favorites include baba ghanouj (smoky eggplant dip), gougeres (cheese puffs), and mustard batons (made with packaged puff pastry!). I can’t wait to see what you have to bring to the party! And don’t forget to enter the giveaway here. Blog hop news: In response to reader requests, I’ve made an entire blog hop page where you can check out past themes as well as a schedule for upcoming themes. I’ll do my best to keep it up to date. Check it out here! Thanks so much for your continued support. I look forward to these blog hops each and every week! Also, I apologize for last week’s blog hop balagan (the Hebrew word for a chaotic mess) – thanks for your patience! If for some reason the blog hop isn’t showing up below, enter your links here and I’ll fix it as soon as possible. Congratulations to your Blog anniversary Katherine! Time is flying by so quickly these days, right? Your appetizers look luscious tempting and very dangerous right now. the first thing I d like to try r your parmesan stuffed dates. That one sounds so exotic, I am pretty much used to caviar canapé for new years, but then it has been a while as well. I am open for new ideas and I am looking forward to learn more appetizers. What a wonderful virtual party! If only we really could get together and bring these dishes to celebrate your second anniversary. That would be some buffet! It is occurring to me that I should have added a cocktail too but I have already done my three. Happy 2-year blogiversary!! I can’t believe you’ve only been blogging for 2 years given how far you’ve come! Your recipes are always delicious, your site is gorgeous and you should be very proud of yourself! Congrats and have a great weekend!! Happy Anniversary Katherine! I love your blog( just discovered it recently) and trying to read all your past posts. Keep up the amazing work! You are an inspiration! Nice virtual party! And I’m looking forward to seeing all the great recipes people contribute (I’m always too lazy to link something up myself! Terrible, I know.). I haven’t make your Cashew Salsa yet, but it’s definitely on the list. Happy blogiversary! All 3 of the apps that you posted above look amazing! Well, you definitely got the party started off right with those delicious appetizers! Happy blogiversary!!!! Have a great weekend Darlin! Congrats on your two year blog anniversary. Hope you have many more years of fulfilling blogging. Lovely selection of light finger food. Great idea about the Blog Hop page! Appetizers are the best, I could easily make a meal out of them! Have always enjoyed making and eating savoury ‘bits-and-pieces’ best of all, and those gorgeous zucchini rollups are really inviting me 🙂 ! If all I ever ate were appetizers and wine all the time, I would be happy. It is such a great way to dine, and an even better way to entertain. Happy two year anniversary to your blog…I’m so impressed with all you’ve accomplished in this short time! Thank you Katherine for both the anniversary giveaway opportunity AND the fun appetizer party. I’ve added some Italian Holiday cheese logs for the upcoming holiday season. I hope that you will stop by for my 4-year anniversary giveaway that begins on the 5th of October. Love this theme! So many good options for my next dinner party! So many great recipes, I don’t know where to begin! Thanks for sharing. I would like to also enter the blog hop sometime and share some of our best appetizer recipes with our raders. OMG!! I’m looking for appetizer recipes for my parties and I get some good ideas in here. thank you very much.